In Kanchanaburi Province there is a forest temple, founded in 1994, which has become a sanctuary for numerous wild animals including many tigers. 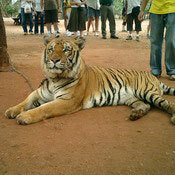 While it is more commonly known as The Tiger Temple, its Thai name is Wat Pha Luang Ta Bua Yannasampanno. 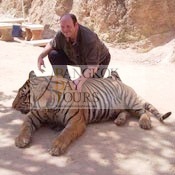 The abbot, Phra Acharn Phusit, has been caring for abandoned tigers since 1999. The mother of the first cub he took in had been killed by poachers. The first tiger cub died from its injuries, but a few weeks later two more tiger cubs were rescued from poachers and brought to the temple. 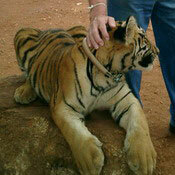 Word soon spread and more abandoned or injured tigers were brought to the temple. 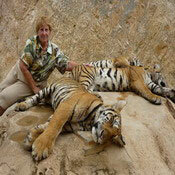 By 2005 there were 17 tigers at the temple. Seven were orphans rescued from the wild and ten have been born and bred here at the temple. The monastery is situated adjacent to Burma. Protected areas and national parks along the Thai-Burma border are believed to contain the largest surviving populations of tigers in Thailand. Unfortunately, while these areas are protected, poaching still occurs. 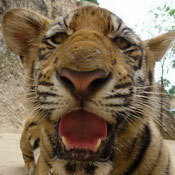 A poacher can earn several years of a farmer's salary for killing a tiger, so the profit is well worth the risk. After the mother tiger is killed the cubs are taken as a bonus, or left to fend for themselves in the jungle and if found are left here.